This is The Magic Box. I don't think I've posted a photo of or talked about The Magic Box. I've come to a point this year where I kind of don't remember if I've already posted something or not. Luckily there's only 3 weeks left to this year! 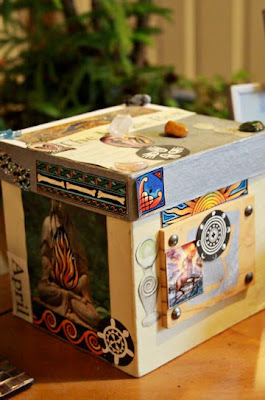 The Magic Box is a place to put wishes, desires and intentions. The energy of The Magic Box then helps for these things to happen or manifest. You have to be specific and sometimes what we want is not what we need and the Universe knows this. We made The Magic Box a few years ago and I have yet to use it. Perhaps I'll throw some things in there for 2010.